Moving a library is a huge project. It's all hands on deck! 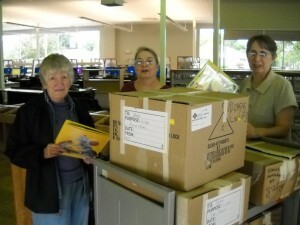 Carolyn Bush, Pat Kelcher and Pat Winkler team up to get the job accomplished. Children’s services are popular at Lochwood Library. We support kids activities however we are able! Splashes of color add to the fun of Story Time for our youngest library visitors. Extras, purchased by the Friends group, add excitement and beneficial resources for children’s programs. 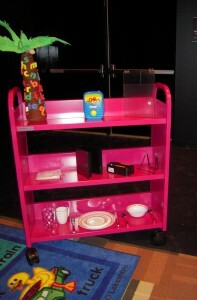 A program cart helps to set up and take down activity areas that maximize the use of library space. The brightly colored ABC rug in the photo is used for story time; a weekly morning event for the littlest readers in our neighborhood. The library also conducts a weekly mom & baby activity called Baby Bounce.